« Don’t Fear, BlakChek is Here!! So here I was in a local restaurant with a group of coworkers after a late meeting. What could go wrong, we were, after all just grabbing a bite to eat before going our separate ways. No need to look at the menu, I knew what I wanted before I stepped foot in the place since it was a local favorite. When the waitress came to take our orders my white coworkers ordered there dishes and then came my turn. “I’ll take the sirloin with mashed potatoes and broccoli” Then came the standard response from the waitress, “How would you like your steak done sir?” I promptly and loudly uttered “Well Done!” Little did I know that these two little words would spark a controversy which consumed the rest of the nights conversation. So anyways, back to the dinner. After getting berated for a solid 30 minutes by five white coworkers our food finally arrived. I quickly jumped into my well done steak and poured A1 sauce all over it, another act that was quickly ridiculed. At this point I was fed up, I had two options; a) Punch all of my coworkers in the face or b) Try a piece of my coworkers medium steak. Although option (A) was appealing at the time, it had its downsides. First off 3 of the 5 coworkers were women, I could get fired, or I could get arrested. Maybe I should go for option (B). As I picked up the visibly pink steak on my fork I had flashbacks of my mothers stern lessons and for a split second option A popped up in my mind again. I finally took my first bite, and was instantly barraged by an onslaught of flavor the likes of which my tastebuds had never seen. It was truly incredible, the steak was juicy, flavorful, and to be quite frank, the bomb. I hated to admit it, but on this issue my white friends were right. So as far as eating a rare steak goes, hold your horses, or better yet your cows. Take it slow, first try medium well, then medium, and if your adventurous you can go for medium rare. I personally stopped at medium, don’t get crazy. So as a final verdict, BlakChek approves medium and medium well steaks. 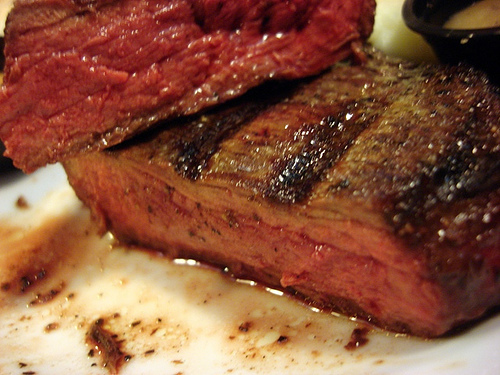 If you go for medium rare or rare, sorry, but your on your own.